Youth Empowerment > “Alias-Rover 2011” – Only one week away! 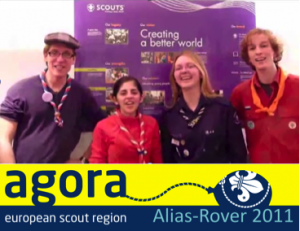 The 4th edition of AGORA, the European Region’s event organized by Rovers for Rovers will open next week at the Kandersteg International Scout Centre. 22 participants will gathered under the theme “Alias-Rovers 2011” and share their experiences and ideas, as well as get updates on new trends and concepts for their age range in different countries across Europe. Various workshops will complete the programme. With participants from 12 different countries, everybody will be enjoying the international spirit for which Kandersteg is so famous: Malta, Denmark, France, Romania, Slovakia, Austria, Netherlands, Finland, Spain, Luxembourg, Sweden and Portugal! Let’s be “Also Known As Rovers” without wearing the scout uniform. Let’s be real, empowered, intelligent, skilled, healthy, serviceable persons, responsible citizens! Let’s be “Alias-Rovers”! Those of you who will not be in Kandersteg for this event, please join Agora’s facebook group and follow, what’s happening: www.facebook.com/home.php#!/home.php?sk=group_183061755051890.